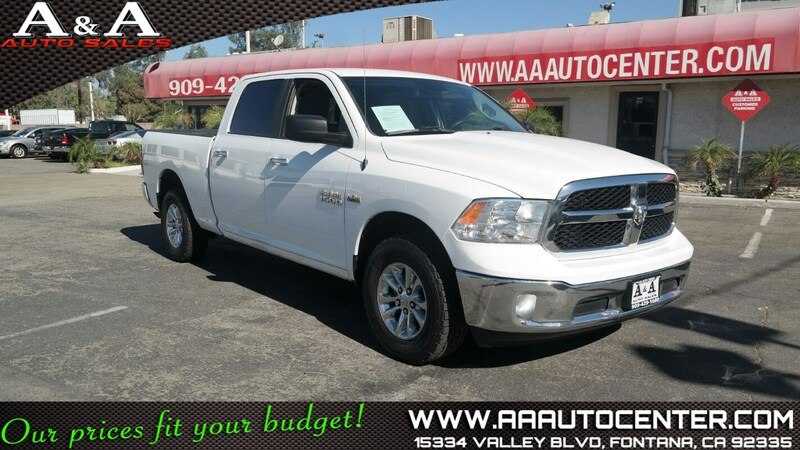 Attractive in Bright White Clear Coat over Grey interior, our 2016 RAM 1500 SLT Crew Cab 4x4 delivers an award-winning combination of muscle, capability, security, and comfort! Powered by a legendary 5.7 Liter HEMI V8 that produces 395hp while paired with a durable 8 Speed Automatic transmission for amazing passing power. This Four Wheel Drive is ready for anything and everything while delivering a comfortable ride with some serious get-up-and-go! For work or play, our SLT has some serious swagger with its chrome trim and distinct wheels plus offers near 22mpg on the open road. Climb inside to find a cabin that feels tailor-made to meet your demands with a wealth of amenities including keyless entry, dual gloveboxes, power accessories, and an overhead console with map lights. Get comfortable in the cloth seats and check out the prominent Uconnect touchscreen with Bluetooth voice commands while you turn up the volume on the impressive sound system with satellite radio. Having undergone decades of rigorous testing and safety and security improvements, our 1500 from RAM offers priceless peace of mind as well. Safety is priority number one with dynamic crumple zones, side-impact door beams, and an advanced airbag system. Tackle your day with this handsome truck and inject some driving satisfaction and capability into each day! Print this page and call us Now... We Know You Will Enjoy Your Test Drive Towards Ownership!